Mechanical dredging and dewatering of approximately 84,000 CY of sediments contaminated with coal-tar remnants (PAHs, VOCs, and heavy metals). Effective amendment and stabilization of 56,000 CY of removed sediments. Placing approximately 115,000 tons of multi-layer cap material, to create an impermeable barrier, encompassing 1,900 ft. within the Flint River. Successful implementation of custom-fabricated equipment to place a subaqueous cap, with extremely low tolerances (+/-0.1 ft.), in a waterway with strong currents. Loadout and off-site transportation/disposal of stabilized sediments and soils. Achieved over 50K safe workhours without a lost-time incident. Located in Flint, Michigan, the Consumer Energy Company’s Flint East Boulevard Former MGP Site (the Site) is located on property owned by the University of Michigan–Flint, United States Postal Service, the City of Flint, and Consumer’s Energy Company. Remediation activities were executed adjacent to the Site, targeting a stretch of the Flint River impacted by coal-tar-contaminated sediments. Particularly challenging at the outset of this project was adhering to an accelerated 27-day site mobilization schedule, which required extensive equipment mobilization and site preparation operations. Sevenson constructed a 265-ft. by 145-ft. lined asphalt dewatering pad; a 100-ft. by 150-ft. material staging pad; a 263-ft. by 141-ft. temporary fabric structure (TFS); two sheet pile unloading platforms; and a temporary 200-GPM WWTP. Scope of site preparation work also included establishing the exclusion, decontamination, and support zones. Additionally, Sevenson mobilized over 100 pieces of company-owned equipment, including a dredging fleet consisting of three Komatsu PC490 long-front excavators; two Komatsu PC300 long-front excavators; front-end loaders, a PC200 excavator; PC300 conventional excavator; three workboats; pumps; two 40-ft. by 60-ft. spud barges; a Sennebogen material handler; six 100-ton hopper scows; storage silos; TFS air handling units; and three tandem dump trucks. 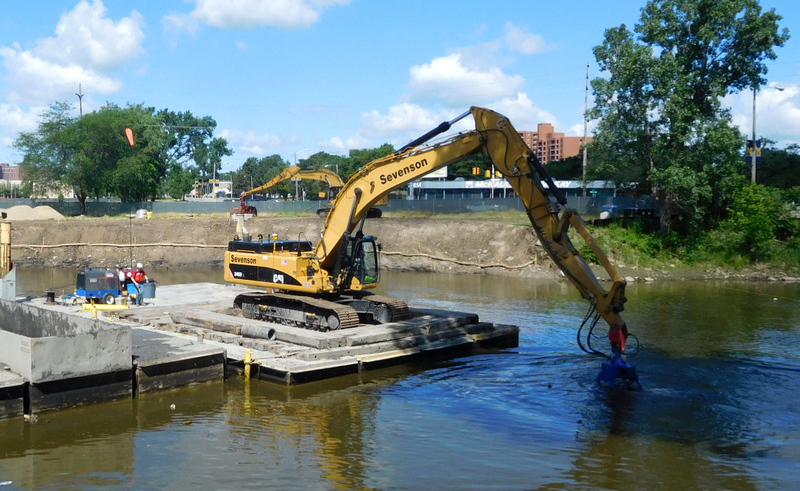 Sevenson also installed unloading platforms at two locations on the eastern shoreline of the Flint River. One unloading platform was installed in the working area upstream and downstream on the eastern shoreline. These unloading platforms consisted of sheeting, backfill, crane mats, and spill protection controls, all of which served to support excavators and function as moor locations for scows while sediment was unloaded or as fill material was being loaded. Before commencing earthwork operations, Sevenson installed temporary erosion control measures, such as silt fencing, to prevent erosion and migration of soils, silts, sediments, and debris outside of the work zone. Temporary turbidity curtains were also placed around areas where the unloading platforms were installed to ensure water quality criteria were maintained. Turbidity curtains were installed downstream of the active dredge area and upstream of the Hamilton Dam. These controls effectively ensured that sediment removal operations did not cause an exceedance of water quality criteria. Sevenson removed timber piles that were used to bolster a historical bridge. Due to the piles being located adjacent to an existing bridge, Sevenson was required to gate and lock each end of the bridge to prevent unauthorized access. 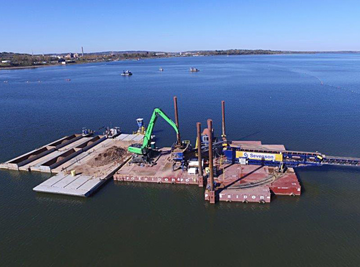 To extract the bridge piles and sediment from the river, Sevenson removed sections of the dredging and capping barges in order to pass the pedestrian bridge. 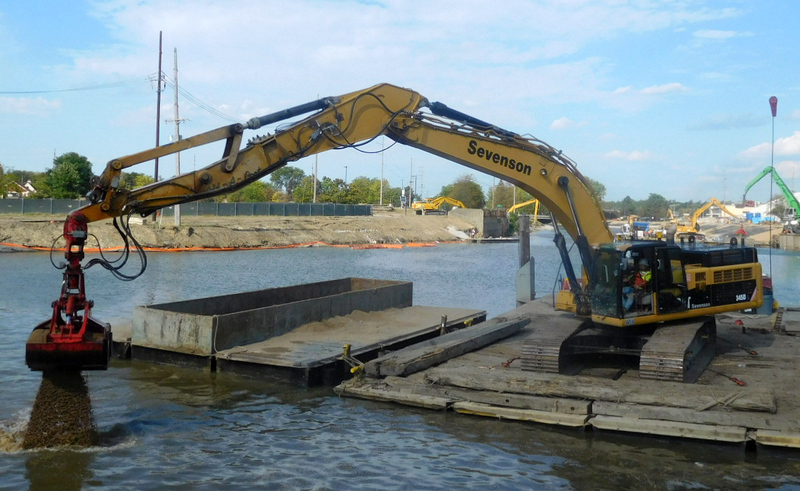 Using a barge-mounted excavator with a grapple bucket/shear attachment, Sevenson cut the piles to a minimum of six inches below the dredge surface, and placed the debris into 100-ton hopper scows to be stockpiled, sized, and disposed of offsite. Prior to dredging operations, Sevenson executed a pre-construction bathymetric survey based on specification requirements. Land-based equipment consisted of a PC300 long-front excavator equipped with a 1.5-CY bucket and marine-based equipment consisted of a PC490 with a 2-CY bucket mounted on a modular spud barge. Both land- and marine-based equipment were equipped with Trimble Grade Control System (GCS) with an add-on Teledyne software program that effectively controlled grade during sediment/soil removal and capping activities, as well as ensured that Sevenson did not exceed grade and did not over/under excavate contaminated sediments. Long-front excavators were equipped with two RTK-GPS beacons, as well as boom and stick inclinometers. This technology enabled the excavator to accurately determine the position of the cutting face of the bucket, its orientation in relation to bathymetry, target depth surfaces, and previous cuts. 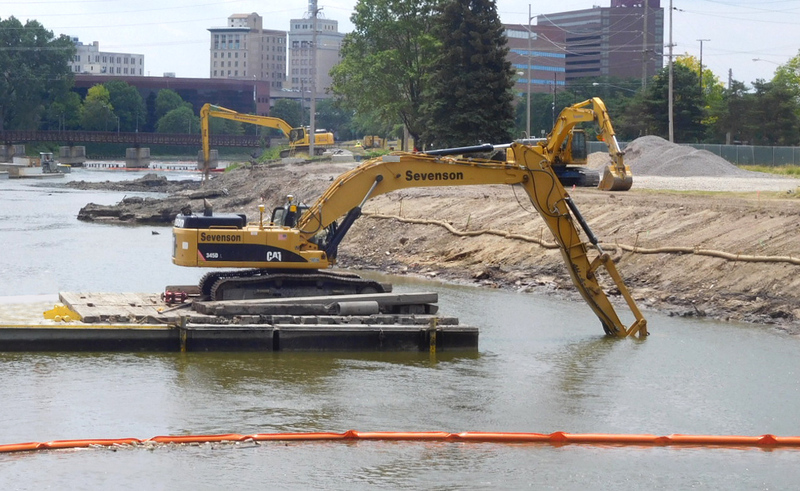 Sevenson’s dredging operations accounted for water fluctuations (tidal variances were not a factor during the course of the project) instigated by the City of Flint’s dam operations. Dam-related water elevation fluctuations varied +/- 3.5 ft. Real-time corrections for these fluctuations and barge-loading were made via RTK-GPS synced with the Trimble GCS. 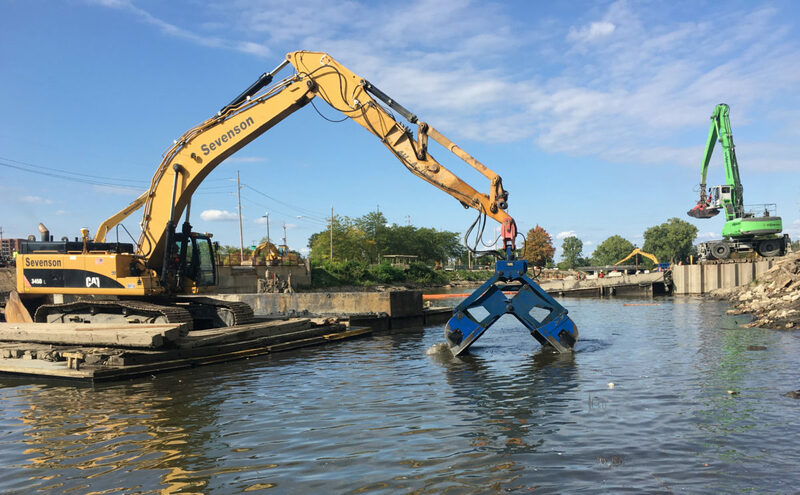 Land-based operations were performed with a long-front excavator positioned on the eastern and western shorelines, while marine-based removal operations were executed using a long-front excavator secured to a spud barge within the river. Sediment and soil removal activities commenced from the upstream portion of the dredge area and proceeded downstream. 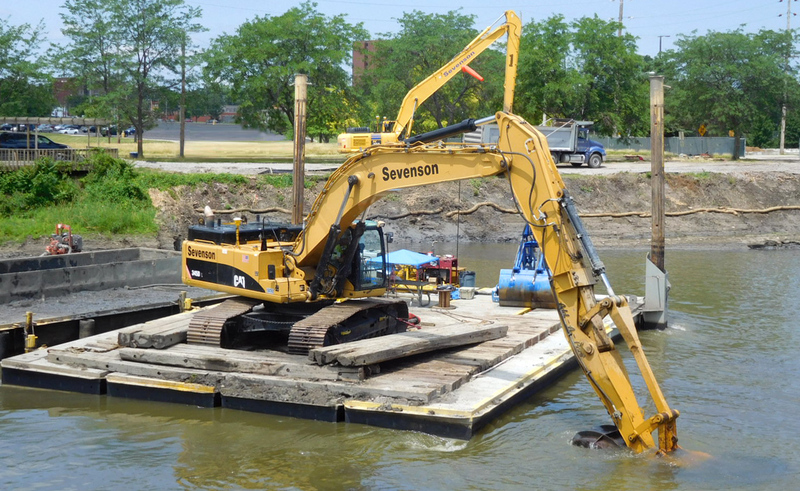 Sevenson mechanically dredged contaminated sediments—with dredge cuts ranging from five ft. to eight ft.—from waters with depths of up to 15 ft.
Soil/sediment meeting paint filter requirements were loaded directly into contracted dump trucks for transportation and off-site disposal. When material was too saturated, it was staged on the bank to decant into the dredge area. As removals were executed, the excavator proceeded downstream along the shorelines. When the sediment was determined to be too saturated for direct off-site disposal, Sevenson loaded a site truck for transportation to the TFS, where it was dewatered and amended in order to meet disposal facility requirements. In order to prevent the land-based excavator from proceeding too far in front on the water-based dredge, Sevenson’s land crew performed additional upland work associated with the outfalls and piping as removal activities progressed downstream. 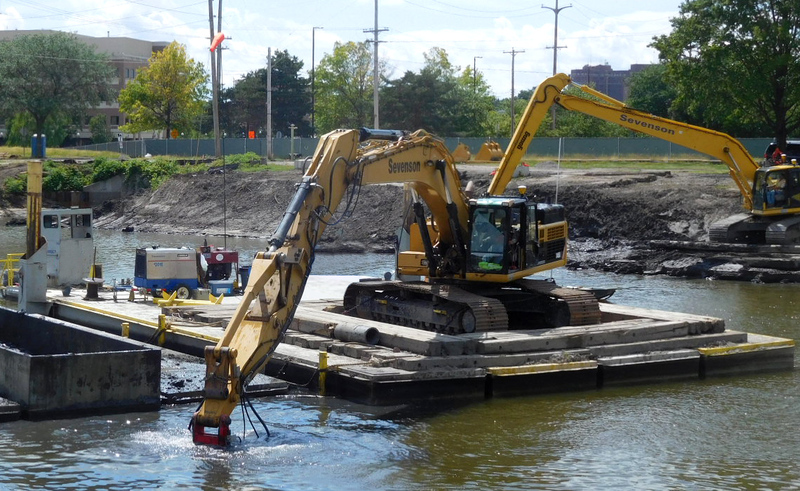 Likewise, marine-based sediment removal operations began from the upstream portion of the work area, south of the 5th Avenue Bridge. The dredge plant was position directly south of the 5th Avenue Bridge to initiate sediment removal with the dredge plant. Due to lower water levels, Sevenson was required to execute sediment removal operation in order to provide adequate draft and proceed downstream. Removed sediment was loaded into custom-fabricated hopper barges which were then shuttled to the unloading platform on the eastern shoreline of the Flint River. An excavator stationed at the loading docks removed the sediment from the hopper scows and placed it into dump trucks for transportation to the TFS and material staging area for stabilization. 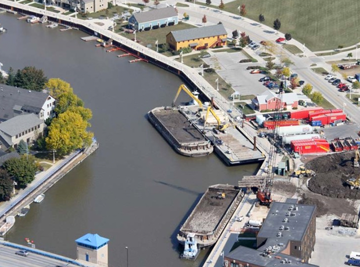 Sevenson was required to remove contaminated sediments from areas surrounding several civic structures, including the Hamilton Dam, pedestrian bridge abutments, and a retaining wall. Using an excavator bucket synced with RTK-GPS position systems, sediments were removed without compromising the structural integrity of infrastructure. To do so, the operator extended the boom of the excavator and curl the bottom of the bucket so that the bottom of the bucket was parallel to the retaining wall and abutment structures. During these operations, the Engineer monitored the automated total station readings to verify that there was no movement/deflection. The TFS was configured with bins that housed sediment removed during dredging operations. Sevenson’s self-constructed lined material handling pad was used support dewatering operations housed within the TFS. Sediment brought within the TFS was dumped inside the mixing bins, picked up with a loader, and placed into sediment mixing bins where it was amended. Sevenson’s originally approved mixing agent for sediment stabilization (lime kiln dust), however, was deemed inadequate by the designated landfill’s disposal criteria. Therefore, Sevenson efficiently switched to using Portland cement application (approximately 4.7% dosage rate) in order to achieve the landfill requirements and avoid delaying the shipment of amended material to the landfill. Following stabilization, Sevenson removed treated sediment from the mixing bins and placed the material in a stockpile for loadout and off-site disposal. The mixing bins were equipped with sumps that collected and conveyed water to the on-site WWTP. 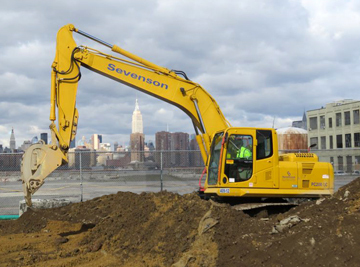 Sevenson self-performed cap installation operations using both land- and marine-based equipment equipped with RTK-GPS positioning technology which enabled operators to place and grade fill materials to a precise elevation. Sevenson placed approximately 115,000 tons of multi-layer cap material, to create an impermeable barrier, encompassing 1,900 ft. within the Flint River. The cap was comprised of a six-in. layer of subbase sand, a 12-in. layer of Blended Barrier©, a six-in. layer of cover sand, a six-in. layer of two-in. gravel, and 1.7 ft. of D50 rip-rap material. Notable challenges during this phase of work included placing cap material on steep slopes. The subaqueous cap installation required placing two separate layers on a 3:1 slope in the Flint River, a waterway with significant current velocities (approximately one ft. per second). Sevenson effectively placed material in thin lifts, which allowed the sand to remain in place rather than migrating down slopes. A second challenge involved managing extremely low cap tolerances. Allowable tolerance for the multi-layered subaqueous cap was +/- 0.1 ft. Installing a six-layer subaqueous cap through the water column in the Flint River, which has a strong current proved difficult. Sevenson therefore utilized state-of-the-art GPS equipment and custom-fabricated equipment (specifically, a mechanical broadcaster positioned on section barges) designed to place thin lifts in order to achieve proper grades. Site restoration operations included placing and grading 2,000 CY of topsoil along the slopes of the Flint River; hydroseed application and establishing vegetative growth across 96,000 SF of topsoil-laden slopes; planting 24 two- to three-in. trees to bolster vegetative regrowth; repairing concrete roadway and curbs; and installing 13,000 SF of a 12-ft. asphalt bike path.